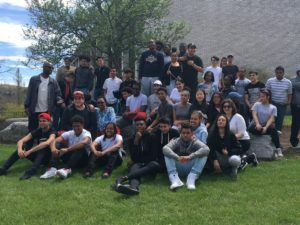 On Thursday, April 27th, through Friday, April 28th, WHSAD junior class embarked on a trip to visit a few colleges throughout New York State. They visited Cornell University, Ithaca University, Alfred State University and Alfred University. At each college, they were given tours of the campus, explanation of all the undergraduate programs offered, and were given many opportunities to have all of their questions answered regarding attending college. The following narrative was written by WHSAD Junior, Kenrick Wilson, describing his experience while attending this trip. Our Junior Class took an overnight trip to visit four colleges in two days as they continued their hunt for what college they would like to attend. The colleges that the students visited were Cornell University, Ithaca College, Alfred State University, and Alfred University. The students were taken on a tour of each campus and had the opportunity to see the different programs each school has to offer them. Along the tour students began seeing things that had caught their eyes in ways would lead them to applying to The colleges to that they witness. They also got a little taste of what college life is like, and what surprises are in store for them in a new chapter in finding there true calling in life. WHSAD has taken its time to prepare their students for the challenges that are ahead by making sure their students have many options when it comes to them picking the college that best fits their needs to be successful in life. It shows how determined a school is to make sure that all students reach there maximum potential and nothing short of it.